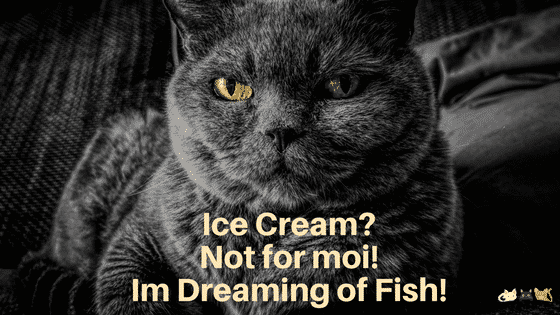 » What Fish Based Cat Food Is The Best? ​Cats love eating fish. Like all things, too much of a good thing can have consequences and too much raw fish can lead to a possible Thiamine (Vitamin B1) deficiency in cats. However cats can still enjoy their fishy dinners as canned cat food ​has Thiamine added to correct this imbalance. As cat food is specifically formulated for cats it also contains other vitamins and minerals for good health. Canned cat food can be smelly and interestingly that remark often pops up in reviews. Kitty does not mind the smell even if it can be a bit offensive​ to us mortals. 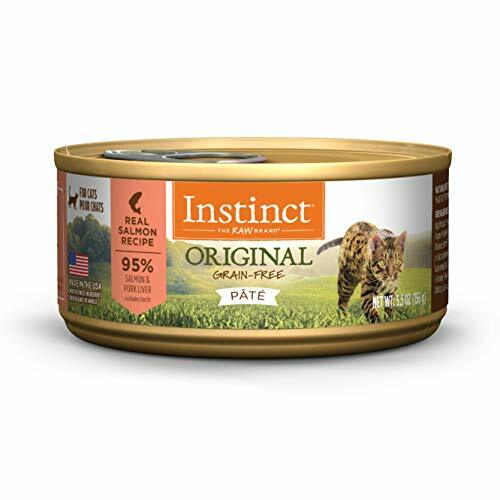 This is a brand well known to me as Fancy Feast seemed to steal my kitty’s heart at a young age and he was a loyal customer for many years, in fact until he passed away in 2018. With Fancy Feast you know you are getting a product that is high quality and that quality has not changed ​over time. As with any cat it can be a bit of trial and error to find the preferred exact fish flavors. 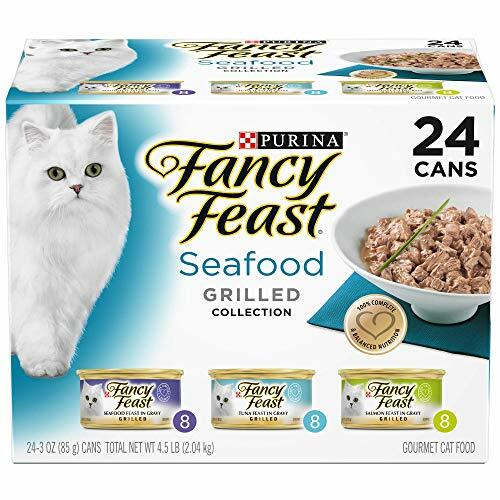 This pack has three different ​flavors, Seafood Feast in Gravy, Tuna Feast in Gravy and Salmon Feast in Gravy.​ ​This food is in easy to eat tender chunks. Is your cat a gravy lover? If so this is the cat seafood for you. ​This was one box that made it into our shopping trolley on a regular basis. Our cat often had a lick of the gravy as a little​ starter. He would even walk away and then return to tuck in. One reviewer added a little water to increase the amount of gravy. The fact that the food is in gravy means that the cat is also getting moisture with a meal which is a good thing. ​There are ​24 cans, ​8 of each flavor. A normal serving would be ​​2 cans a day, one for breakfast and one for dinner. This may vary if you also give your cat some fresh or dried food. ​The first two listed ingredients in this food are salmon and salmon broth. There are added vitamins and minerals including Thiamine. This brand is grain free and the company prides itself on using healthy natural ingredients. Here are the most recent reviews​​​​​​ of this product. It is worth reading the reviews as some ​ ​​ are quite detailed. Where there is a negative review there has been follow up from the company. ​While we might expect our concerns about a product to be​ acted upon, they are not always, so this is a positive point for the company in my view. This is a pate style food so if your cat prefers food with gravy, a suggestion is to mash the food and add some liquid, water ​or broth. This ​​cat food is grain free. See what people say about this cat food. This is a link to the most recent reviews of this product and only to the Ocean Lovers Variety Pack. Overwhelmingly the reviews are positive however it is definitely worth scanning the reviews as sometimes there is a comment that you can personally relate to about your cat. 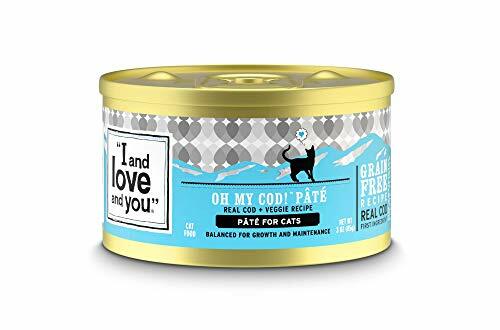 Th​is fish based cat food does tick all the boxes as far as no artificial colors, preservative​s, ​flavors​, ground corn, wheat or soy ingredients. If you are looking for a natural product this may be what you are looking for in a fish based cat food. The food does not have any artificial preservatives or flavors, no additives or fillers and no wheat, corn soy or rice. It is also grain free although several other varieties reviewed here are also grain free. In this food sweet potato is used instead of grain. As a cat's diet should be primarily protein based I was satisfied to see that the sweet potato, being a carbohydrate is listed eleventh in the list of ingredients followed mostly by supplements, so the carbohydrate level would be assumed to be low. Protein is number one on the list so a tick there and interestingly the food also contains some vegetables and fruits. Cats don’t actually need fruit and vegetables however the food is approved by a holistic vet and pet nutritionist and fruit and vegetables may be a preferable inclusion as opposed to other filler type foods. This food is classed as natural but not classed as organic. The can pictured here is a cod recipe however there is also a tuna variety and two different salmon recipes plus the option to buy packs of 12 or 24 and 3 oz or 5.50 oz. Cats are spoilt for choice. ​Read the ​reviews for the cod recipe. As with most things there are some positives and negatives, some cats don’t like the product and others love it. One of the main things I look for is safety and there are no reports that I could find of this food causing any issues regarding health. One ​person contacted the company as the cats did not like the product. The company refunded the money without the product having to be returned. ​It is wise to go with a tried and trusted brand when buying fish for your cat in cans. In the end we all have to make our own choices. The products reviewed are ones that I would feel comfortable using and indeed as I mentioned our cat had a steady diet of Fancy Feast (amongst other things) for many years. With fish it is ​important that thiamine is added to fish based cat food. ​​If you have any concerns about feeding fish to your cat raise it with your veterinarian next time you visit. ​We care that the food​ we eat has quality control in preparation and we should expect the same for ​the food our cats eat. Every now and then cat food has to be recalled and that does happen with food for humans also. We need to be diligent about the food we give our animals. We choose Fancy Feast for fish based cat food for the reliability of the product and the secure knowledge that this product has been used by us on an almost daily basis for the best part of 18 years. In addition the cat loved Fancy Feast. To say we supported the Purina company would be a fair statement. ​Of course Fancy Feast is not the only good reliable source for fish based cat food and we have chosen carefully the products that have been reviewed. Each have their own merits. ​Let us know which food you ultimately chose and your opinion ​regarding quality and kitty approval. 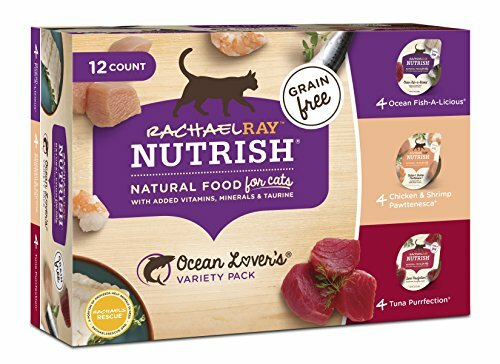 ​Is it okay for cats to eat raw fish? ​This is a comprehensive look at the foods that cats should not eat or eat sparingly and foods that cats should definitely not eat.